People who say they have guns in their households continue to be more likely than those who do not to say that the government is a threat to their personal rights and freedoms. About six-in-ten (62%) in gun-owning households see the government as a threat, compared with 45% of those without guns; this gap is no larger today than it was three years ago. The survey finds continued widespread distrust in government. About a quarter of Americans (26%) trust the government in Washington to do the right thing just about always or most of the time; 73% say they can trust the government only some of the time or volunteer that they can never trust the government. 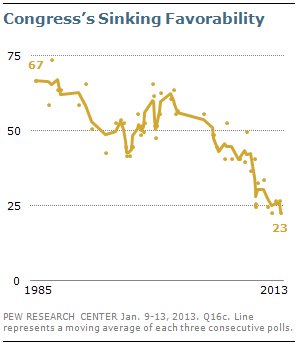 Explore a Pew Research interactive on Public Trust in Government: 1958-2013. Just 20% of Americans say they are basically content with the federal government; 58% say they are frustrated while 19% say they are angry. For the most part, these views have changed little during Obama’s presidency. However, the percentage saying they are content with government sank to a low of just 11% in August 2011, following protracted negotiations between the president and congressional leaders over raising the debt ceiling. The same survey found that the percentage expressing anger at government had reached 26%, and just 19% said they trusted the government at least most of the time. 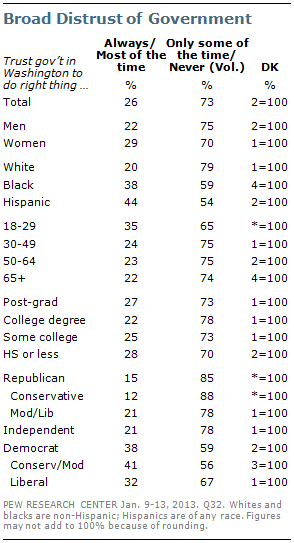 Opinions about Congress, while little changed over the past year, also remain very negative. Just 23% offer a favorable opinion of Congress, while 68% express an unfavorable view. Favorable views of Congress hit 50% in spring 2009 but subsequently have plummeted. For two decades between 1985 and 2005 Congress was generally viewed more favorably than unfavorably. The low point during that period came in the fall of 1995 – just prior to the government shutdown of that year – when 42% offered a favorable opinion of Congress. When asked if the current problem with Congress is a broken political system, or the members themselves, most people continue to point to the lawmakers. 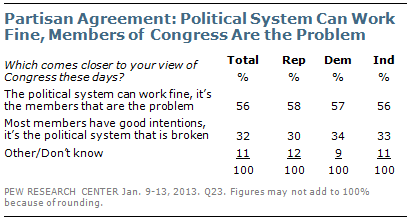 A majority (56%) says that the political system can work fine, it is the members of Congress that are the problem. Only about a third (32%) says that lawmakers have good intentions and it is political system that is broken. At a time when there are wide partisan differences in opinions about government, there is broad agreement that members of Congress are the problem. Virtually identical majorities of Republicans (58%), Democrats (57%) and independents (56%) say that lawmakers, rather than the political system, are the problem with Congress. 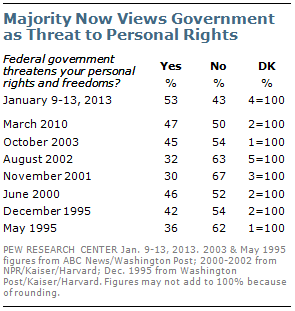 Overall, 53% of Americans think that the federal government threatens their own rights and freedoms; 31% say it is major threat, while 22% say it a minor threat. 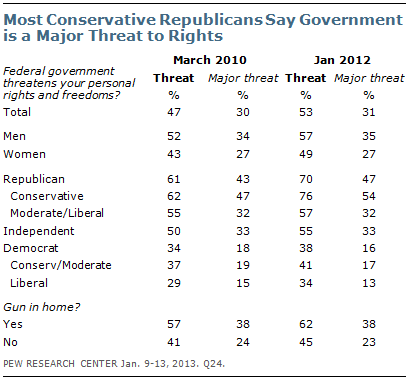 Roughly three-quarters (76%) of conservative Republicans say that the government threatens their personal rights, and most (54%) say the government poses a major threat, by far the highest percentage of any ideological group. Among moderate and liberal Republicans, 57% view the federal government as a threat to personal rights and freedoms and just 32% say it is a major threat. These opinions, like those among Democrats and independents, are little changed from March 2010. For the past seven years, a period covering the final two years of the Bush administration and Obama’s entire presidency, no more than about three-in-ten Americans have said that they trust the government in Washington to do the right thing always or most of the time. The current survey finds only about quarter (26%) saying they can trust the government always or most of the time, while nearly three-quarters (73%) say that they can trust government only some of the time, or volunteer than they can never trust the government. The Pew Research Center’s 2010 study of attitudes toward government found that, since the 1950s, the party in control of the White House has expressed more trust in government than the so-called “out party.” But partisan differences in trust in government have been much wider during the Bush and Obama administrations than during previous administrations. 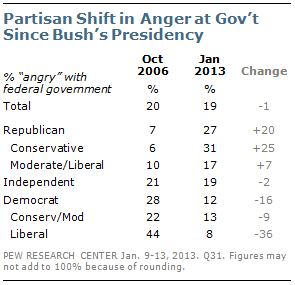 For more, see “Distrust, Discontent and Partisan Anger: The People and Their Government,” April 18, 2010. Public frustration with the federal government is not new. Since 1997, only once has a majority said they were “basically content” with the government – in November 2001, two months after the 9/11 terrorist attacks. Over this 15-year period, majorities have consistently said they are frustrated with government, with smaller percentages expressing anger. The percentage saying they are angry at the government reached a high of 26% in August 2011, following the deal to lift the debt ceiling. 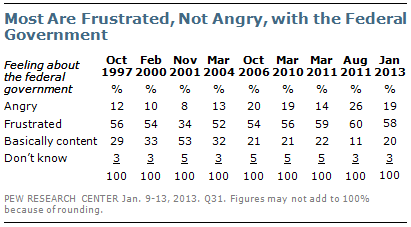 Currently, 19% feel angry at government, 58% are frustrated, while 20% are basically content. Conservative Republicans are more likely to say they are angry at the government: 31% say they are angry, compared with 17% of moderate and liberal Republicans and much smaller percentages of Democrats. In October 2006, during George W. Bush’s second term, those at the opposite end of the ideological spectrum – liberal Democrats – were most angry at government. At that time, 44% of liberal Democrats said they were angry at the federal government, far higher than the share of conservative Republicans expressing anger today.